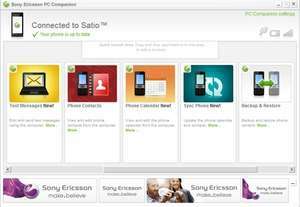 Sony Ericsson PC Suite (or SE Phone Tools) is a Windows application for use with your modern SonyEricsson mobile phones. It's the default software which Sony issues and therefore it may seem a little bit bloated. It does, however, offer mobile users the very handy option of backing up data. One should be careful, though, because some user complaints of backed up data gave them a subsequent error of not being able to restore it! Version 2.10.303 is a freeware program which does not have restrictions and it's free so it doesn't cost anything. For security reasons, you should also check out the Sony Ericsson PC Companion download at LO4D.com which includes virus and malware tests. Additional screenshots of this application download may be available, too. Sony Ericsson PC Tools has a presence on social networks.